A crucial vote on agrofuels in the European Parliament on September 11th has failed to fix a flawed policy which is driving deforestation, landgrabbing, human rights abuses and undermining communities' food sovereignty in producer countries like Indonesia. Members of the European Parliament set a 6% cap on the use of agrofuels (land-based biofuels) to meet Europe's demand for fuel – currently, Europe's agrofuel consumption is 4.7%. This increase will have major impacts on food security in some of the world’s poorest countries. They also voted for the accounting of emissions from Indirect Land Use Change (ILUC) in the Fuel Quality Directive, but this will not be introduced until 2020. The decision on the cap is disappointing - CSOs from Europe pushed hard for a maximum 5% cap - and the delay in introducing ILUC emissions accounting is seriously irresponsible. This means another seven years of Europeans paying high subsidies to support biodiesels which have a bigger carbon footprint than fossil fuels. Recent studies show that when ILUC emissions are taken into account, the majority of agrofuels are no better for the climate than fossil fuels and, in some cases, are worse. 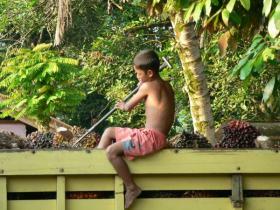 Palm oil, which is used in the production of biodiesel, has one of the biggest carbon footprints. Indonesia, the world's biggest palm oil producer, is planning to more than double its oil palm estate which extends to around 11 million hectares today. According to Sawit Watch, the government has already issued preliminary concessions covering 26.7 million hectares of land for palm oil development, over a third of which are on peat. Earlier this week, Indonesian CSOs led by WALHI and Sawit Watch appealed to MEPs not to ignore the devastating impacts of biofuel production in producer countries such as Indonesia. said Nur Hidayati from WALHI (Friends of the Earth Indonesia). said Clare McVeigh of DTE. Direct land use change happens where land is cleared for agrofuel crops. Indirect land use change (ILUC) is the knock-on effect: where land is cleared to make way for crops that have themselves been displaced by agrofuel crops. Where this is land with high carbon stocks (such as forests or peat-lands), ILUC increases carbon emissions. Other ILUC impacts include destroying forests and biodiversity, removing local peoples land rights and threatening the security of the worlds food production yet these impacts are not accounted for in the Renewable Energy Directive (Directive 2009/28/EC) and Fuel Quality Directive (Directive 2009/30/EC).